Crown Books for Young Readers, 9780385388818, 256pp. Fifth grader Kate (the Great) is back in business. Specifically the food-drive business, as she, Brooke, and (odd) Nora try to win the Junior Guides competition. But lately their trio has felt imbalanced, with Kate on the outside. It doesn’t help that the American Revolution unit at school is turning everyone against each other. Armed with her smarts, an artillery of doodles, and maybe even some advice from Eleanor Roosevelt, Kate must find a way to keep her friends, old and new. New York Times bestselling author Suzy Becker is back with fifth grade artist Kate Geller, who brings more wit, attitude, and doodles. 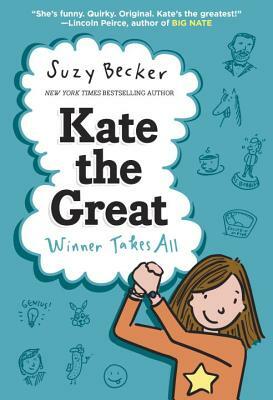 With over 400 illustrations and brimming with humor, Kate the Great: Winner Takes All is perfect for fans of Diary of a Wimpy Kid and the Dork Diaries and any reader looking for slice-of-life tales about family, school, and life.